RE: An unknown error occurred. If there is just one link in the description I can't save it. I had to remove the link from the optional link field (which is for the mod's forum topic link) too! If there is no link in the description, but I put a link to a forum topic in the optional link field I can't save. This worked before like charm, but about 1 or 2 months ago this started happening. File upload is problematic too. I browse the file, clicks on the submit button, the page reloading and nothing happens, I have to submit the file 2nd time to be uploaded. Some times looks like nothing happened after the 2nd submit just the edit form reloading again and I have to navigate to other page and back to my mod page and just after that appears the pending aproval message. I found out what causing my problem! If I write links in the description or into the optional link fileld which is for the forum topic link, I can't save my mod page. If I delete every links from the description and from the link field I can save the mod page! Maybe a misconfigured rule causing the problem? In case of most of my mods I can't save the mod's page after I edited it. I edit the mod's description (or else) and I push the save button and the "saving" pop-up appears for a sec and disappears and thats it, nothing been saved! I edit the mod's description (or else) and I push the save button and cloud flare captcha appears. I identify my self as human (:D) then appears a page with error witch say me that the page doesn't exist. I tried with Firefox and Chrome, with and without adblocker, nothing helps. Some of my mods I can edit, but most of them I can't. I'm using Windows 10 64bit. This is a texture mod which enhance and fix the female juggalo’s textures. Doubled the resolution and enhanced the quality of the textures with AI technology and made some final touch and fix with Photoshop. Fixed: black coloring on the forehead, nape, and around the eyebrow. You can use this character with a trainer like „Simple Trainer for GTA V”, in the „Model Spawning” menu find the a_f_y_juggalo_01 in the „Spawn Female A Peds 2” section. You can change the appearance in the „Clothes menu”. MORE INFORMATIONS AND DETAILED INSTALLATION INSTRUCTIONS IN THE README FILE! New BUGFIX UPDATE is out! Added Bokeh texture (new): Enhanced the original bokeh texture for more real life bokeh effect and dubled the resultion. Do not download this mod out of GTA5-mods.com for your safety! The Real | RAGE project contains all of my Real | RAGE mods (Real | RAGE Graphics Enhancer - Real | RAGE Weapons and Damage Enhancer - Real | RAGE 4K Water Overhaul - Real | RAGE - Vehicles Enhancer) with exclusive features! Exclusive features like body physics, dispatch, pickups, etc. modifications. 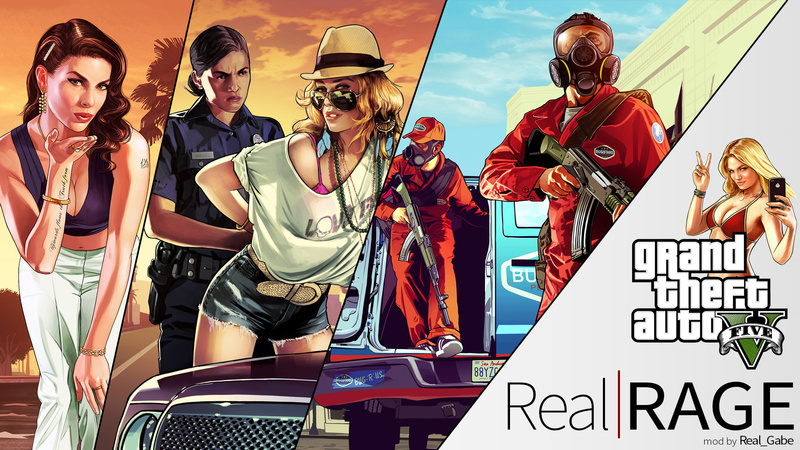 This project’s goal is to enhance the GTA V experience in all way. Like more cops patroling with more variety of vehicles and on foot too, cops and army using flashlight on their weapons, more people on beaches and promenades, adjustments for physical and other reactions of the body, e.g. bullet hit reactions, balancing, ragdolling, etc. More infos in the readme files. RELEASE NOTES IN THE README FILES! Maybe if I set an extreme value to the deformation multiplier, but I 'm not gonna do this because I think it's unplayable that way and the roof not gonna flat completly because sadly the deformation model is not made to work that way. If you want a more detailed destruction/deformation model you have to alter the core of the game, so only Rockstar Games can do this. Compatibility update: now compatible with game version 1.1180.2. New DLC cars not yet enhanced!